Preheat oven to 375 degrees. Soften brown sugar and butter in the microwave for 1 minute on high. Add eggs and vanilla. Mix well. Add flour and baking soda to sugar and egg mixture. 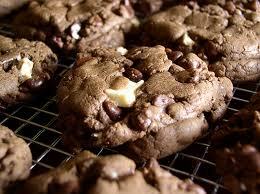 When well mixed, add chocolate chunks, vanilla chips and walnuts. Place by well rounded teaspoonfuls on ungreased insulated baking sheet. Bake for 10-12 minutes or until slightly brown on the top. Makes approximately 2 dozen.